You need a server in order to complete this step. If a server is not available, you can complete this step except for Publishing the files. The SOAP Agent service is handled like the other Integrator services which you have already implemented in this workshop. When you publish your SOAP Agent files, they are moved to the Bindings folder and you will NOT need to reboot the JSM Server to run them. 1. Display the Project tab in the LANSA Integrator studio. 2. Expand the EmployeeAgent folder. 3. Right click the iiiEmployeeAgent.SOAP.jar file to open the context menu. 4. From the context menu, select Send To and then Integrator Folder. Your file will be moved to the bindings folder of the Project. 5. Right click on the SOAPAgentService.properties file to open the context menu. 6. From the context menu, select Send To and then Integrator Folder. Both of your files are now in a folder in the Project / Integrator folder. 7. Collapse your Solutions folder and expand the Integrator folder until you can see the jar file in the bindings folder and the properties file that you have just moved to the properties folder. 8. Now you must Publish your files (that is, move them to the required JSM server). If necessary, in your Project tab, open the Server you are using, so that the server instance is shown in the right hand pane. 9. Move the jar and properties files from your local folder to the JSM Server's folder. a. Select and right click the iiiEmployeeAgent.soap.jar file in the bindings folder to open the context menu. b. Select Publish File from the context menu. Your jar file is now moved to the JSM server's bindings folder. 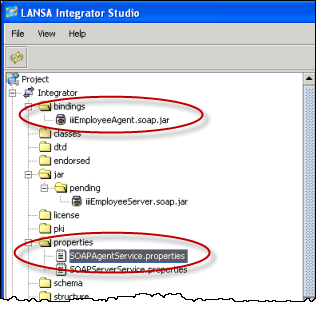 c. Right click on the SOAPAgentService .properties file in the Integrator / Properties folder to open the context menu. d. Choose Publish Section from the context menu. Your properties file is used to add a section to the SOAPAgentService properties file on the server.